How often to do you hit yourself on the head and say, "why didn't I think of that?" That is how many felt when Patrick Sexton and David Mihm launched GetListed.org. 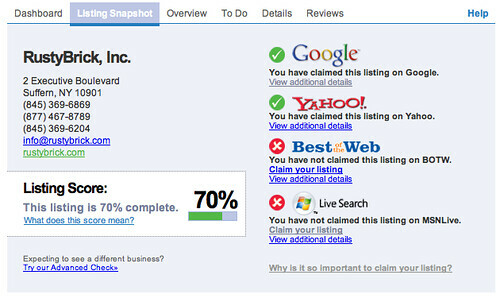 GetListed.org is an incredibly useful and easy to use tool to quickly see how your local search listings play in the local search space. Also, you can see a to do list, all your reviews and the details of your listing by those four engines. I suspect GetListed.org will continue to add more engines over time. Matt McGee posted his review at Search Engine Land and the Sphinn discussion around the new tool is excellent. This tool is an excellent idea and I am glad it was created.